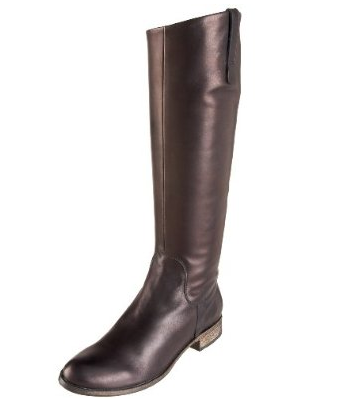 Style Advice: How do I dress up tall flat leather boots for work? Re: the boots, I did end up buying them! They were $200 on Amazon including shipping, compared to $600 for similar boots at Gravity Pope, so that makes them doubly amazing. I probably couldn't wear leggings and a long top with them to work, or jeans for that matter, but dresses and skirts are a go. Thanks for your input! You've already hit the nail on the head by suggesting dresses and skirts as a starting point. Sweater dresses and dresses in heavier, winter-appropriate fabrics will keep you cozy. If sleeveless numbers are frowned upon, layer long-sleeved tees underneath or wear a cardigan on top. You could very well have a capsule wardrobe of work-appropriate day dresses to wear with your tall boots Monday to Friday and call it a day. But wearing a dress day in and day out would be a bit boring, wouldn't it? Mix-and-match separates provide so much more versatility. Skirts in wool or twill, a neutral hue or a bright orange or mustard, and of any knee-length silhouette (mini, pencil, paper sack waist, A-line) would work well with a pair of tall boots. So what do you wear tucked into the skirts? Jewel-toned silk blouses offer the same professional polish as a tailored button-up shirt, but look and feel much more luxe and offer more freedom of motion. Drapey tees in soft jersey also work. Lastly, accessories such as scarves, earrings, bracelets and belts can go a long way in personalizing the looks I've suggested above. I know that Megan has an extensive collection of earrings she likes to wear. Personally, I favour necklaces that add drama and fun to an outfit. Of course, the key to pulling off skirts and dresses paired with tall boots during winter is to wear tights or leggings underneath to keep your legs warm! Do you wear tall flat boots to work? What do you wear them with? These are great suggestions. I definitely wear boots to work, but then again, my dress code is very flexible/casual so I don't have to worry about looking too conservative. I think when paired with dark jeans/trousers and a blazer, boots can look quite put together as well. That striped sweater dress is SO calling my name! I love tall boots with pencil skirts since it reminds me of the 1960s mod era.